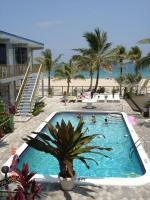 This Lauderdale By The Sea resort is located on the Atlantic Ocean, 15 minutes from downtown Fort Lauderdale. This oceanfront resort features an outdoor pool, private beach and free Wi-Fi. This Tavares hotel is conveniently located off US-441 and offers an outdoor pool and rooms with a refrigerator and free Wi-Fi. Nova Southeastern University is 8.3 miles away. All rooms at Americas Best Value Inn boast air conditioning and cable. This Cocoa Beach hotel is one block from the Atlantic Ocean and 5 minutes from Port Canaveral. The beach hotel features a game room and outdoor courtyard with volleyball courts. Minutes from beautiful beaches and set in the heart of historic town centre Stuart, Florida, this hotel offers easy access to local attractions and modern in-room amenities, including microwaves and mini-refrigerators. If looking for a get-away holiday for yourself, family or friends, this hotel is ideally situated in the centre of the popular Fort Lauderdale Beach Boulevard strip. Celebration Vacation Rentals feature two to five-bedroom homes with backyard pools, fully equipped kitchens and two to three bathrooms. These Kissimmee, Florida rentals are centrally located to Walt Disney World. Located just 2 miles from Disney World The Clarion Suites Maingate in Kissimmee, Florida is a quiet, family-oriented destination close to the excitement but away from the hustle and bustle of Orlando. Kids can find plenty to do at the hotel, from splashing in the outdoor pool and kiddie pool to playing in the game room.